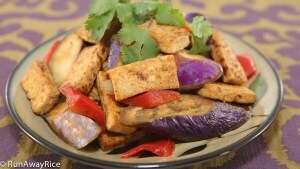 A vegetarian’s delight, this dish with pan-fried tofu and eggplant is healthy and delicious. (Sorry, this is not the deep-fried and overly saucy dish you find in many Asian restaurants.) It’s a light and flavorful dish that allows you to enjoy the tasty goodness of fresh vegetables without all the oil and heavy sauce. This basic stir-fry is super versatile and works well with most vegetables. Feel free to add more veggies or swap out the eggplant for squash, zucchini or whatever you prefer. Feel free to substitute the tofu with seitan or tempeh. Both are great meat-free alternatives. If you cannot find Chinese eggplant, the classic Black Bell or Italian eggplant works well too. Soaking in the salt and lemon juice solution is unique to the preparation of the eggplant as it helps to remove the sap from the eggplant. If you’re using other vegetables, you do not need to soak them. It you prefer a saucier dish, don’t cook down the stir-fry sauce and this will become more of a braised (kho) dish rather than a stir-fry. The coconut water is the secret ingredient, so don’t skip it. It makes the eggplant nice and tender and gives the sauce lots of subtle flavor. Cook the eggplant to the doneness you like. Some people like the eggplant really soft (cooked about 10-12 minutes). I enjoy it more on the crunchy side and so cook for 6-8 minutes. I mentioned this in the video but will re-iterate: it’s normal for both the skin and the flesh of the eggplant to turn brown when cooked. This does not affect the taste and is just the natural oxidation process. Remove the tofu from the packaging and gently rinse with cool water. Dry the tofu using paper towels. Cut the tofu into 1/2-inch thick slices. Cut each slice into 4 equal pieces. Lay the tofu pieces on a large plate covered with a paper towel. Allow the tofu to drain further while continuing with the next steps. Peel the onion and cut into chunks. Core the red bell pepper and cut into bite-sized pieces. Trim off ends of the eggplants. Cut each eggplant at a diagonal into slices approximately 1-inch thick. In a large bowl, add the sliced eggplant, salt and lemon juice. Fill up the bowl with cold water. Place a plate, slightly smaller than the bowl, on top to submerge the eggplant in the water. Allow the eggplant to soak for 15 minutes. In a measuring cup, combine the soy sauce, vegetarian stir-fry sauce and coconut water. Combine together. Heat a large skillet or wok over Medium heat and when hot add 1 Tbsp vegetable oil. Add the tofu. Pan-fry on each side for 3-4 minutes or until golden brown. Transfer to a clean plate and set aside for now. Drain the eggplant using a colander and then rinse with cool water. Toss the eggplant in the colander to shake off any excess water. Heat the same skillet over Medium High heat and when hot add 1 Tbsp vegetable oil. Add the onions and stir-fry for 30 seconds. Add the tofu and stir-fry sauce. Increase the heat to High and cook until half of the liquid is evaporated, approximately 4-5 minutes. Reduce the heat to Low, add the red peppers and eggplant and combine together. Cover the skillet and cook for 8-10 minutes or until the eggplant is tender. Top with freshly ground black pepper. Serve over hot rice with a side of soy sauce and chopped red chilies. When I go to the Asian supermarket, What does the vegetarian stir fry sauce look like? I made this dish last night, but didn’t have eggplants and bell pepper so I used zucchini and dried shiitake mushrooms instead. It was so delicious, I took a picture of it but I don’t know how to send it to you. Thank you for sharing.